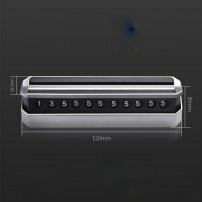 Creative Car Phone Number Card Plate Temporary Parking Card, Creative Car Phone Number Card Plate Auto Accessories Creative Privacy Protection Instantly Switch the Number of Display and Hide [AP005911A] - $4.95 : allputer.com - Accessories for all your Portable Electronics & Computers! This is an essential tool for every car. It may help for temporary packing or even all the packing spaces are occupied. If are just around the packing space, you may just park the car and have the number on, then people can call to you and when you come back, you've already got a parking space. Of course, don't go too far because it is not that courteous that people need to stand there to wait for you too long! - COMPACT DESIGN: Small and exquisite appearance, not take up much car space. - EASY TO USE: Install the box in appropriate place of the car, and you can instantly switch the number of display and hide. - CONVENIENCE: When there is no parking space or temporary Parking, placing the number plate so that someone else can find you. The number on plate that can be see clearly whether day or night. - PRIVACY: You don't need to show to all the people your number, just show when you need to show, you have full control.